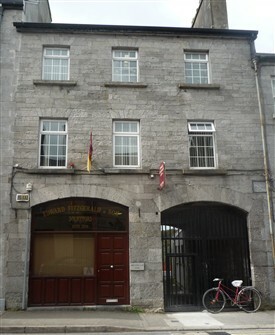 There is a plaque above the carriage entrance archway, on right of this building, beside downpipe that records Robert Tighe, Justice of the Peace, had erected this large cut stone building dated 1851. It is ascribed as an eight bay, three storeyed ashlar cut-stone townhouse c. 1850 by Mayo County Council’s protected structure building no 237. Robert was probably the son of Thomas D.L, who appeared in Slater’s Commercial Directory of 1846, and was listed a wholesaler and Spirit and Wine Merchant on Market Street (now Main Street). He is also listed as a Brewer and a Tallow Chandler. 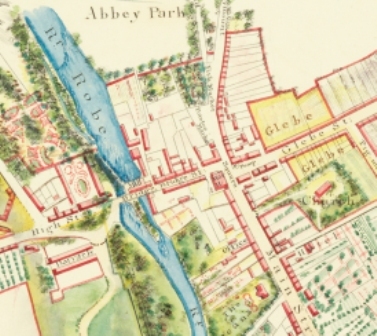 According to the NUIG, Moore Institute's Landed Estate records (The Landed Estates Database provides a comprehensive and integrated resource guide to landed estates and historic houses in Connacht and Munster, c. 1700-1914). “Robert Tighe was a prosperous merchant of Ballinrobe, in the mid 19th century who bought lands for sale in the Encumbered Estates' Court. At the time of Griffith's Valuation Robert Tighe held 3 townlands in the parish of Kilmainemore, barony of Kilmaine, County Mayo, previously part of the estate of Arthur Browne of Glencorrib, parish of Shrule and one townland in parish of Crossboyne, barony of Clanmorris, bought from the Blakes of Merlin Park. Robert Tighe held a townland in the parish of Templetogher, barony of Ballymoe, county Galway, in the mid 1850s. By 1876 members of the Tighe family owned more than 2,000 acres in county Mayo and 1,025 acres in county Galway. Part of the Tighe's county Mayo estate was sold to the Congested Districts' Board in May 1906. Catherine was 27 years old when she died and is buried in the old Churchyard of Carnalecca Church. Thomas died at 87 years of age in 1914 and he is buried in the same graveyard. His properties were notable for the neat and clean appearance and “neatly thatched cottages in which his tenants live have no fermenting manure heap before the door to offend passer-by’s”. He was also mentioned as being responsible for his tenants having a well built wall in front with a neat gate giving entrance to a little flower garden or clean yard. He supplied his tenants twice a year with whitewash and insisted that the tenant’s cottages be decorated twice a year. This created a good impression. It appeared that this man showed respect for his tenant’s and cared for their well being and health and, as a consequence, he was well regarded in the area. Inside the original façade of the Credit Union building a modern structure has been constructed. The Credit Union Office has a exhibition in memory of Felix Waitkus, the American/Lithuanian pilot whose plane – Lituanica II – crash landed in Cloongowla (1 mile outside Ballinrobe town) on 22nd September 1935. Felix was attempting to fly single handed from the US to Lithuania. A sculpture in his memory is located at the start of the Bower’s Walk. Very interesting article found in the Archives Section in Clongowes Wood College, Kildare. 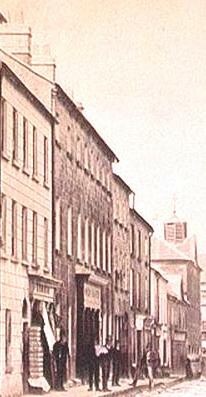 Five of the Tighe family attended school at Clongowes with the first son arriving in 1835. One boy, Joseph, aged 15 died there in 1843. 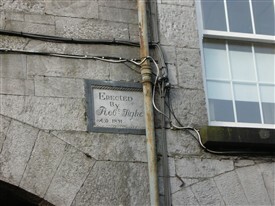 He is buried in family vault in Ballinrobe graveyard. Three other cousins from The Heath also attended Clongowes. I think they must have travelled by train. A lot of the Tighes joined the Connacht Rangers.